Palli Karma-Sahayak Foundation (PKSF) is all set to launch a new project for microenterprise development in Bangladesh. The ‘Microenterprise Development Project (MDP)’ will extend financial assistance to 40,000 micro-entrepreneurs, of which 70 percent will be women. 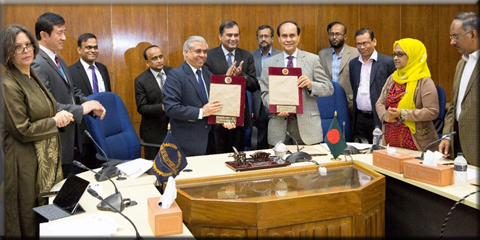 A Loan Agreement and a Project Agreement in this regard was signed in NEC-2 Conference Room of Economic Relations Division (ERD), Ministry of Finance, Dhaka on 6 February 2019. ERD Secretary Mr Monowar Ahmed and Mr Manmohan Prakash, Country Director, Bangladesh Residence Mission of ADB signed the Loan Agreement, while PKSF Managing Director Mr Md Abdul Karim and Mr Manmohan Prakash of ADB signed the Project Agreement. Under the Loan Agreement, ADB will provide US$ 50 million from its Ordinary Capital Resources to PKSF through the Government of Bangladesh for implementation of the MDP. The main objective of the project is to promote development of microenterprises for inclusive economic development and rural poverty reduction. This will also help PKSF upscale its existing microenterprise program that has an entrepreneur outreach of 1.40 million. Ms Farida Nasreen, Additional Secretary of ERD; Mr Md Fazlul Kader, Deputy Managing Director-1 of PKSF; Mr Shahriar Kader Siddiky, Joint Secretary of ERD; Dr Akond Md Rafiqul Islam, General Manager of PKSF; Ms Mst Rabeya Akter, Deputy Secretary of ERD; Mr Md Mesbahur Rahman, Deputy General Manager of PKSF and other senior officials from ERD and PKSF were present during the agreement signing ceremony. Mr Md Abdul Karim, the PKSF Managing Director, mentioned that almost 20% of the 13 million participants of PKSF’s inclusive financial programs are eligible for microenterprise loans. PKSF has so far covered less than 50% of them through its existing microenterprise lending program. The project will support improving access to finance for microenterprises through PKSF and its Partner Organizations (POs). The overall project fund comprises a loan of US$ 50.0 million and a technical assistance grant of US$ 500,000 for capacity development. This two-year project will be implemented through 80 POs of PKSF with a particular focus on the identified microenterprise business clusters.